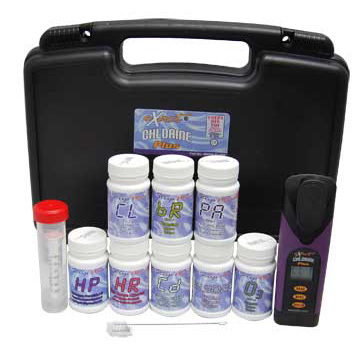 While the average person does not have a need to for chlorine levels much above 3 to 5 parts per million, and even then they would typically only need to do so to make sure their swimming pools had a sufficient amount of free chlorine, but other folks have the need to test for free chlorine levels in excess of 25 or 50 parts per million on a regular basis. Below we will list a few of the places where you might expect to see a need for high range free chlorine testing. After fresh produce leaves the fields it travels to a processing facility where it typically gets washed with a solution containing some sort of sanitizer such as chlorine, ozone, etc. In cases where the produce processing plant uses chlorine employees must make sure the rinse water contains a certain amount of free chlorine after it has passed over the fruit/vegetables. Levels of free chlorine drop with an increase in biological load (contamination) and the rinse water having free chlorine left after use indicates that the produce no longer contains biological contamination on its surfaces. State laws require that childcare facilities clean their surfaces with properly mixed sanitizing and disinfecting solutions that contain an appropriate concentration of sanitizing or disinfecting chemicals. In many cases these facilities use chlorine bleach solutions for cleaning purposes. As a general rule these solutions must contain anywhere from 50 to 200 parts per million free chlorine for sanitizing solutions and anywhere from 500 to 800 parts per million free chlorine for disinfecting solutions. 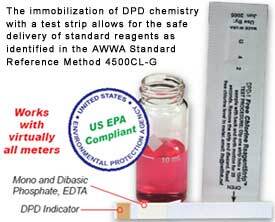 In case like this the Waterworks High Range Free Chlorine Test Strips will not work because they have an upper detection limit of only 120 parts per million free chlorine, but WaterWorks Free Chlorine Check Ultra High II has an upper detection limit of 2,000 parts per million free chlorine and works well in this application. Some states leave it up to individual childcare facilities to determine testing frequency of sanitizing and disinfecting solutions while other states, like North Carolina for example, have strict laws dictating how often childcare facilities must perform testing. 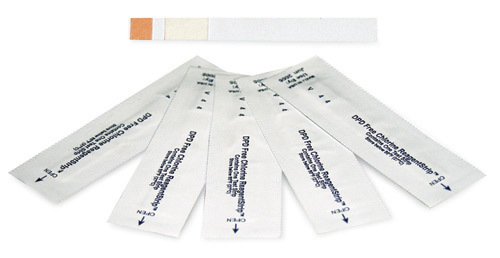 If interested in purchasing a test kit for testing sanitizing & disinfecting solutions in a childcare facility, you can find them readily available in the Water Test Kit Store. Before a water line can go into service for the first time or go back into service after a breakage or leak has gotten repaired technicians must flush (burn) the lines with water containing a high concentration of free chlorine to clean out any and biological contaminants. Typically the technicians must test the discharge water periodically until the free chlorine level remains constant at a high level for a set amount of time. 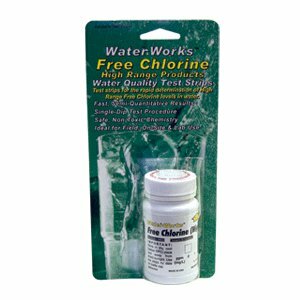 Waterworks High Range Free Chlorine Test Strips work very well for this application. Several members of the Water Testing Blog staff have spoken with members of the military, both currently enlisted and recently discharged, and found out that some soldiers do not have access to simple, efficient tools they can use to test potential drinking water while deployed in foreign countries. In most cases they carry packets of sanitizing/disinfecting tablets which they can use to put into their canteens to kill off bacteria, but what about lead, arsenic, cyanide and other items which can EASILY render an entire unit inoperable and take them away from their assigned duties? 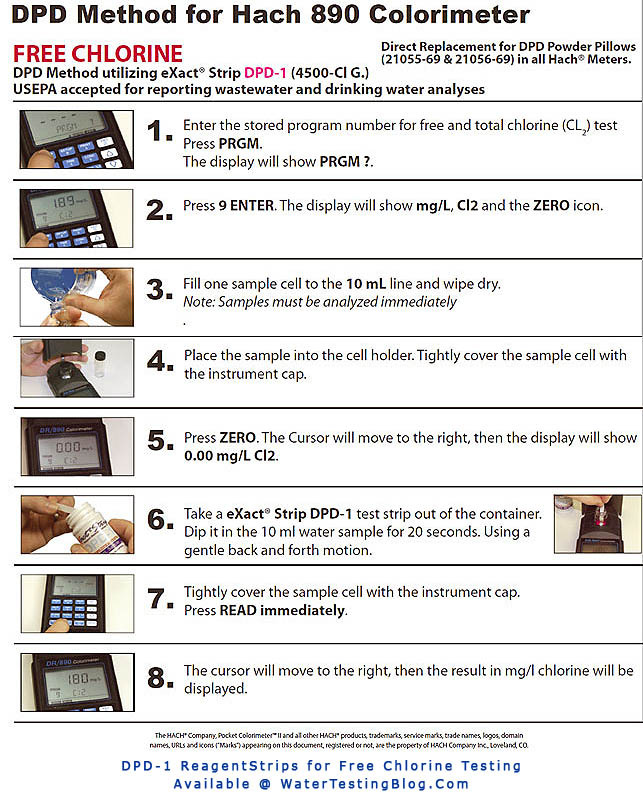 Thankfully US Army, Navy, Air Force, and Marine Corps medical units deployed around the globe now have the ability to make use of simple water quality test kits which give them the ability to read basic water quality parameters quickly and easily. Most of us know how badly we feel after ‘a night on the town’ filled with margaritas, martinis, cocktails and body shots because of dehydration. Now try to imagine how our soldiers must feel after a few MONTHS in the desert wearing full combat gear. Safe drinking water means safer soldiers.